RNA silencing has human therapeutic potential and there is a large research enterprise focused on this topic addressing problems of efficacy and delivery – topics of great interest to insect biologist looking to exploit the power of gene silencing for functional genomics or more applied purposes. Hausseker (2014) has recently written a brief review entitled “Current issues of RNAi therapeutics delivery and development” published in the Journal of Controlled Release that is a nice summary of the current state of the art in RNAi delivery in mammalian systems with specific interest in therapeutic treatments of disease in humans. Hausseker (2014) considers a number of ideas that were relevant me in terms of the strategies used in our lab to deliver RNA silencing agents to perform gene knockdowns in our insect of interest, the tsetse fly (Glossina morsitans). RNA is being developed into therapeutics for humans and targeting a number of different modes. The inability to generate germline transgenics in tsetse limits the types of genetic manipulations one can perform on this insect and RNAi is our best (only?) genetic technology. Consequently advances and improvements in somatic-based knockdown technologies would be a welcome development for us and other insect researchers . Performing gene knockdowns in humans using RNA silencing technologies is technically challenging. Solutions to problems associated with delivery of RNA silencing technologies in humans will provide valuable insight into the development and application of new approaches in insect systems. The genome of the Tsetse Fly, Glossina mortisans, was recently reported. In particular, Hausseker (2014) considers RNAi formulation (ie. using various carriers) and delivery strategies which are also of great interest to insect biologists. Other considerations include the specific target gene, the tissue(s) in which the gene is being expressed, the timing of gene expression relative to when the treatment is applied and if there is an easily detectable phenotype expected to result from the knockdown. These are all things that should be taken into account prior to executing a knockdown experiment in insects as well. We have used a few different RNAi agents including in vitro-synthesized dsRNA “straight”, in vitro synthesized dsRNA processed into siRNAs with recombinant Dicer enzyme and commercially produced siRNAs. All these have worked in our hands, however there is no clear winner as to the best approach to use because each gene target can vary in its response. One of the most important things we have found in these experiments is to ensure treatment groups are tightly synchronized in terms of age, physiological state and timing of injection. We also try to use large sample sizes to reduce variability and increase statistical power. The article by Hausseker (2014) describes how there are three main delivery options for therapeutic RNAi triggers – lipid nanoparticles/LNPs, GalNAc–siRNA conjugates and Dynamic PolyConjugates/DPCs. These delivery modes facilitate the RNA’s passage into tissues. A systematic analysis of these delivery strategies in insects could be informative. Targeting genes expressed within the nervous system might benefit from the use of these strategies – this tissue type is notoriously difficult to obtain significant knockdown effects in using current approaches in insects. We have utilized a couple of different delivery methods but primarily we resuspend our dsRNA/siRNAs in PBS and inject them into adult flies via intrathoracic injection of ~1-2 µg of material. This has worked well in our hands in knocking down genes expressed in the fat body and reproductive organs within tsetse. 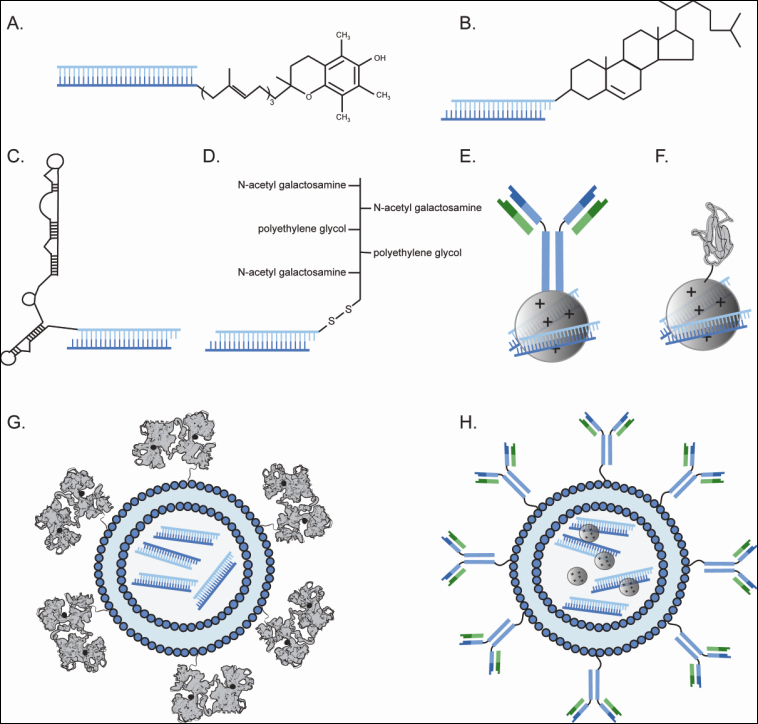 A small collection of siRNA delivery strategies. However, we have found recently that knockdowns targeting genes in the proventriculus and digestive tract can be achieved by directly feeding tsetse siRNA spiked blood meals. Additionally, some preliminary experiments with fluorescently labeled siRNAs suggest that they can be transferred directly from pregnant female tsetse to their intrauterine offspring and that they are active in the larval flies. This is an exciting development for us as direct injections into the intrauterine larvae are very difficult. We are looking forward to the continued development of new RNAi technologies that are appearing on the horizon to make this technique more powerful, reliable and easier to implement. Haussecker D., Current issues of RNAi therapeutics delivery and development. J Control Release. 2014 Aug 9. pii: S0168-3659(14)00567-7. doi: 10.1016/j.jconrel.2014.07.056. I am sure you and other readers have thought about this but for those who might be new to thinking about RNAi in insects–comparing what I know about RNAi in Drosophila with what I have read about RNAi in other insect species, it seems clear that best-practice methods, including but not limited to reagent delivery, have to be worked out species-by-species, e.g. due to differences in what’s practical for a given species and differences in endogenous RNAi responses. It is exciting that the toolbox of possible reagent delivery methods includes, as you point out, several distinct methods, such that a researcher attempting RNAi in a new insect system can try a variety of different approaches with the hope of finding one or more that works robustly. Direct intrathoracic injection of dsRNA works pretty well for expression inhibition in the gut, fat body and reproductive organs of the kissing-bug Rhodnius prolixus. Feeding the bug on blood containing dsRNA can also be used.